We’re making a number of changes to the U-Fix-It. Our goal has always been to provide residents with tools to assist with many common household issues, and we believe a number of changes are required to continue to meet and exceed this goal. 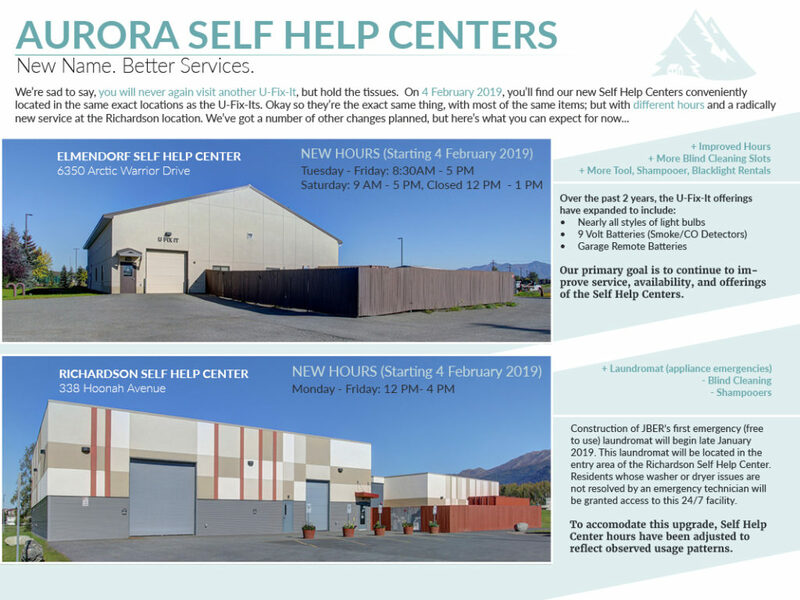 From now on, we’ll refer to the U-Fix-It as the “Aurora Self Help Center“. It’s easier to identify, and stays in line with other Military installations. We will be able to accommodate more blind cleaning appointments each day. While not required, using our ultrasonic blind cleaning machine can make your blinds look good as new during your tenancy or on move out. Long story short, most resident efforts to paint walls at move out are a waste of your time and ours. Our paint team touches up walls on change of occupancy maintenance, and can blend new and legacy paint more quickly. Paint/wall related charges for touch up are rare; paint charges typically result from factors, like smoke, that cannot be remedied by touch up paint. Should you require touch up paint during your residency to correct a cosmetic issue (i.e. the movers scratched a wall, etc), please contact our maintenance team for further guidance. Read our full memo here. If you wish to do something at move out, priming walls is a good way of showing our paint team areas in need of repaint. Centralizing all shampooers will help us perform quicker repairs, decrease wait times, and maintain a larger stock. We will be opening up an emergency 24/7 laundromat in the JBER-R Aurora Self Help Center. This will be made accessible to any resident who has an emergent issue with a washer or dryer, and is awaiting repair. There are over 16,000 appliances on JBER. While our appliance team, whom specializes in appliance repair, can usually resolve the issue; sometimes the machine must be swapped or a part must be ordered. In these situations, our emergency laundromat will enable you to do laundry, without having to leave JBER. This service will be located in the area currently occupied by our blind cleaning machine in the JBER-R Self Help Center. 24/7. A member of our team will provide you with an access code during business hours upon placing your request for maintenance. We’ll have a TV, counters for folding laundry, washers, dryers and seating. The facility will be monitored by camera. All of these changes will go into effect 4 February 2019. The JBER-R U-Fix-It/ Self Help Center will be closed for construction from 28 January 2019 to 1 February 2019.